Since the revolution in 2011, Egypt has gone from holiday hotspot to tourist slump. Now, more than ever, is the time to enjoy the vast history and beautiful culture of Egypt, when fewer tourists are trampling through the country’s pyramids. Instead of jostling to peer at ancient relics, you can explore to your heart’s content in a very relaxed atmosphere. And what better way to discover Egypt than from the luxury of a cruise liner? Here are some of the best shore excursions you can expect when visiting the land of the pharaohs. The ancient Egyptians will forever be immortalised as one of the greatest civilisations to have ever existed. On this trip you can sample some of the most innovative creations of Egypt, including the Pyramids of Giza, the last remaining wonder of the ancient world. From there you can spend hours in Cairo museum, pouring over the 120,000 artefacts from Egypt’s history – yay, mummy spotting! The museum includes Tutankhamen’s treasures and the remains of Pharaoh Ramses III, who was lauded as a great Egyptian warrior. Afterwards, sightsee around the great pyramids and high-five the Sphinx. The Cairo Museum, Cairo, Egypt. If you want the grand tour of Cairo, this is the shore excursion of your dreams. Enjoy a stroll through the medieval Citadel of Saladin and the Mosque of Mohammed Ali (not that one). Of course, no shore excursion to Cairo would be complete without a tour of the pyramids and a trip down to the banks of the iconic Nile. On this tour, you head back to Egypt’s roots: its first capital city, Memphis. Here you can see the ruins of the temple of Ptah, the fallen statue of Ramses II and the cemetery of Sakkara. Almost 5,000 years ago, the famous engineer and healer Imhotep built King Zoser a step pyramid. You can finish your tour at the Papyrus Institute to buy a few tokens for your loved ones before hopping back on board for a well-deserved glass of champagne. Cruise down the Nile river and approach Cairo while being entertained by the fantastic belly dancers. Stop by at the Papyrus shop to learn how to make paper the Egyptian way. 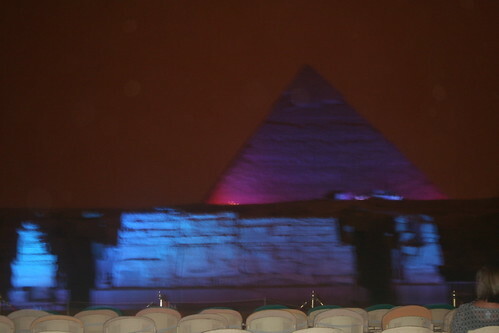 As the light begins to fade, marvel at the sound and light show over the ancient pyramids, which is a must-see event. A light show at night on the Nile River at Giza. If retail therapy is what you’ve come for, you can enjoy a shopping trip in Cairo as well as the stunning architectural feats of the Egyptians – win, win. The City Stars shopping complex is a centre of American proportions and offers you great places to grab a snack too. This way you can explore the Pyramids of Gaza and see the Sphinx for yourself in the kind of style that befits an Egyptian goddess. Article by Tony, a British travel blogger writing for cruise.co.uk, where you can book cruises online. Image Source: JeffFran and jtriefen.